Bringing together high energy live shows, fast paced performances, and memorable riffs with heavy hooks to boot, Disposable are the epitome of modern thrash. Now, with their second album almost complete, a UK tour and a fresh line up, Disposable are ready to grab UK thrash by the balls with the release of ripping new single and accompanying, ‘Ravenous’. With a technical edge to the riffs, a groovier vibe to the verse and an anthemic melodic chorus, the track marks a new direction for Disposable. ‘Ravenous’ is the bands most diverse piece of work so far, while still keeping its roots firmly in thrash metal. 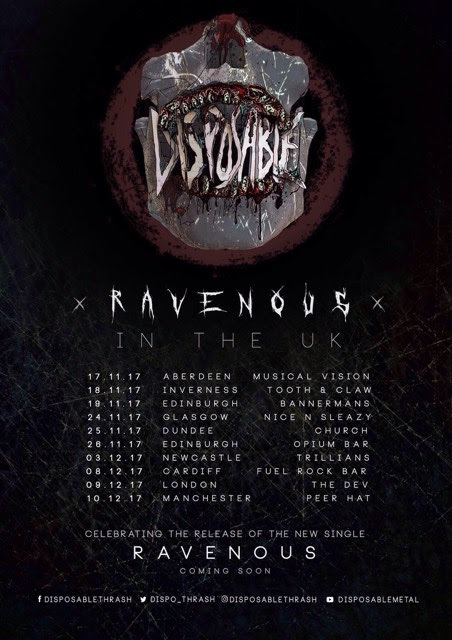 For ticket information about any of the shows on Disposable’s tour, please visit their Facebook page.Hailing from Edinburgh, Disposable formed in 2009 with the desire to inject some good fun into the rich Scottish metal scene. 2014 saw the band release their debut album ‘At The Foot Of The World’ and in 2016 they released follow up EP ‘Life Misguided’. To date they have played hundreds of shows across the UK, as well as making numerous festival appearances including a storming set at the prestigious Wildfire Festival and performing alongside Arch Enemy at the inaugural Heavy Scotland festival.